Island Food Pantry is one of the ways Islanders help to alleviate hunger. 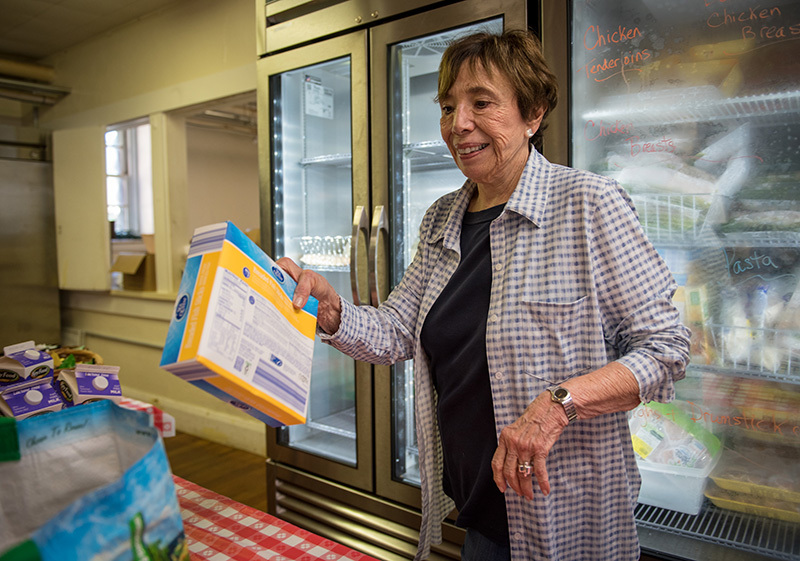 “Making good, healthy food available for people who need it is our mission,” declared Margaret Hannemann, the Island Food Pantry’s coordinator. Hannemann took over in 2017 from 20-year veteran coordinator Armen Hanjian. Hannemann spoke on “The New Island Food Pantry” during the Neighborhood Convention meeting in early October at the First Baptist Church. She has researched and implemented several innovations in procuring and distributing food that are enhancing the service provided to the growing population of hungry Islanders. Retired since 2006 from a career in engineering, Hannemann was chatting with bridge-playing friends about volunteer work. The problem of food inequity and the Island Food Pantry came up. “Call Armen Hanjian, he’s been looking for someone to take it over,” a friend told her. 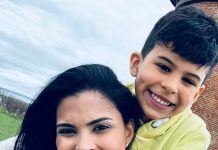 Soon Hannemann was working with Hanjian, learning the routines, ins and outs, and challenges of the Island Food Pantry. Six months later she was the coordinator. “It’s been more full-time than I expected, but also more rewarding,” she reflected. Before describing updates to the already vital program, Hannemann highlighted the extreme need and food inequity on the Vineyard, and efforts underway to combat it. She emphasized that anyone can find themselves without resources enough to feed their families; for some it is ongoing. Seniors no longer working find Social Security benefits don’t cover costs. It can be temporary, due to job loss or a health, financial, housing, or other crisis. “They come temporarily, and we help them if we can,” Hanneman said. Hannemann said that along with the Island Food Pantry, other groups pitch in to keep Islanders’ hunger at bay. 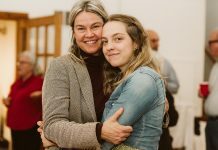 She noted that the organization’s relationship with its longtime host, Christ United Methodist (“Stone”) Church in Vineyard Haven, remains strong. The Vineyard Committee on Hunger and Island Grown Initiative promote efforts to keep neighbors well fed. 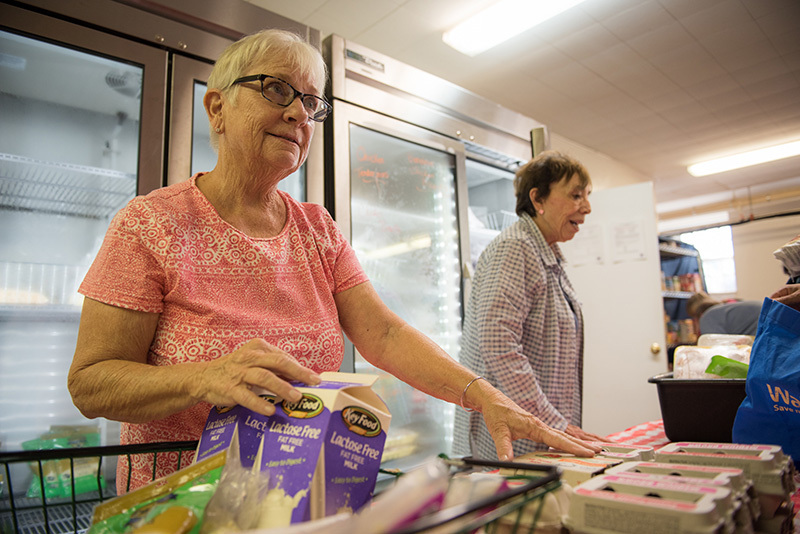 Serving Hands is a monthly distribution program for qualified recipients; Betty Burton oversees Family 2 Family, bringing holiday meals to those in need. 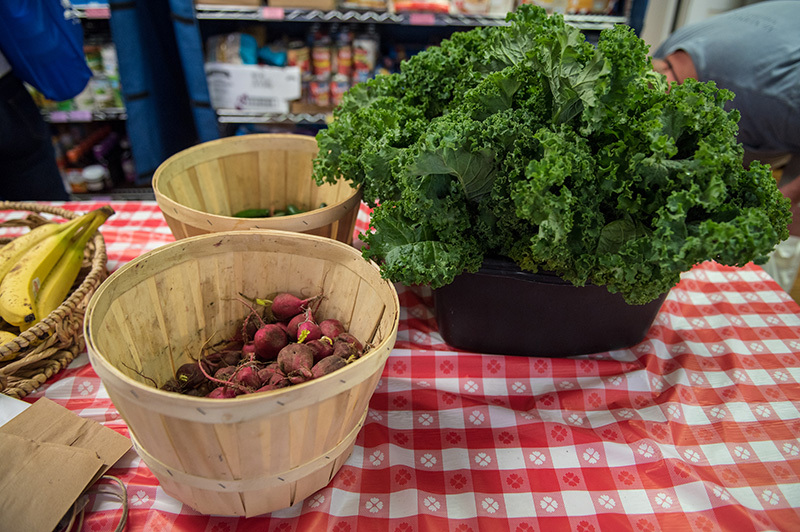 The pantry offers local produce thanks to the M.V. Gleaners, spearheaded by Jamie O’Gorman, and the Farm Hub, which donated vegetables and even sunflowers through the growing season. Island hunters play a part, donating venison that is processed and packaged for distribution. Another boon is donation of surplus food from seasonal food and lodging businesses shutting down for the winter. The annual Church World Service CROP Walk, held last weekend, contributes a large percentage of its revenues to the pantry. The Rotary Club matched funds raised by teams of walkers representing food programs. 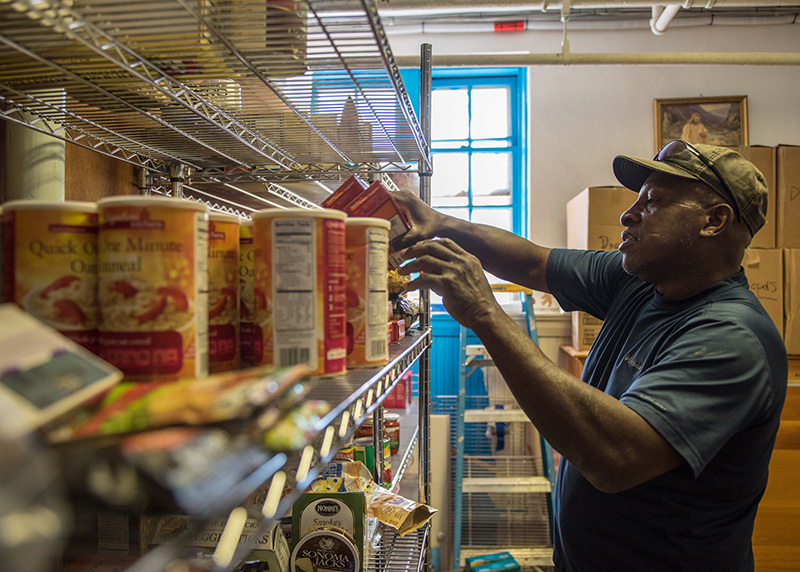 The Island Food Pantry receives extensive support from local groups and individuals. Schools and classrooms hold food drives; libraries accept food for the pantry in lieu of fines; organizers of weddings and special events ask guests to donate a food item. Churches, banks, police and fire departments, town halls, the M.V. Hospital and other groups, businesses, and organizations collect food to fill pantry shelves. M.V. Hebrew Center students gathered more than 100 bags of food; National Honor Society members at the regional high school sponsored a collection. Oak Bluffs School second graders held the largest food drive of 2017. Visitors to the renowned Gatchell Family Christmas light display in Oak Bluffs drop off food items. Middletown Nursery’s annual Family Fun Day, held on Oct. 28, contributes all profits from activities to the pantry. “We depend on those drives. It’s good food for us, and it’s making the community be part of what we’re doing, making us one Island, one community. “And we desperately depend on our purple boxes in churches and grocery stores. That is a lifesaver to us all year long,” Hannemann said. Even with other sources of food, the pantry counts on individual donations, those cans of soup or tuna and boxes of cereal, pasta, or rice dropped off after a shopping trip. Even pet food and personal care items are needed. 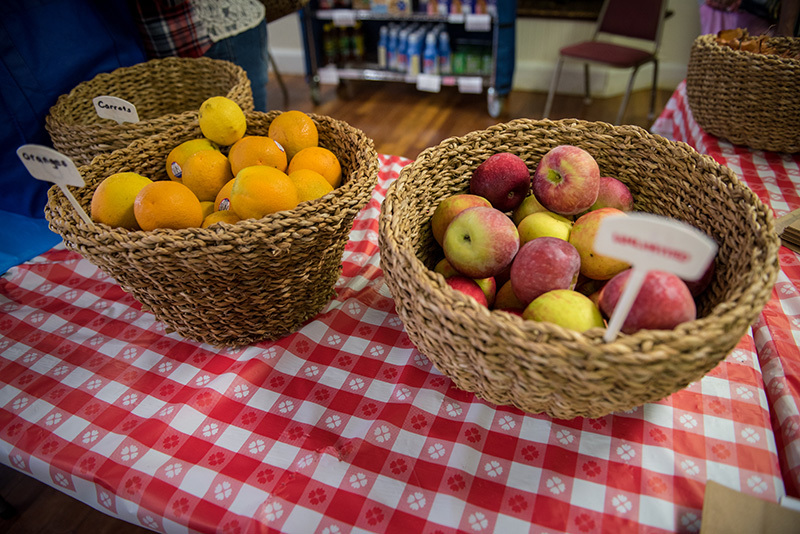 Thanks to a recent connection with the Greater Boston Food Bank, the pantry can provide a broader variety of food, including fresh produce and frozen meats. Most is purchased at heavily discounted prices, and some is free. Although the weekly off-Island pickup, unloading, and storage of perishable foods all add demands on volunteers, the benefits are worth it. “It’s been a game changer,” said Hannemann. Reflecting current trends in food pantry operation, modified distribution invites patrons to select their own choices from the shelves, unlike the previous practice of providing pre-bagged groceries. “People have been thrilled,” Hannemann reported. A significant scheduling shift keeps the service available year-round instead of the previous October to April. This summer, doors opened Wednesday afternoons, accommodating some 100 visits each month. Even the check-in process, overseen by longtime volunteer Carol Early, has been modernized. Thanks to new software, a computerized system makes registration easier and more efficient. In another new bonus for patrons, public health nurse Lila Fischer will be on hand two Wednesdays each month for a wellness clinic, with blood pressure checks, information, and informal health chats. Coming soon, a resource table will provide information on the many services available to the community. More than 65 Islanders handle a variety of jobs. Work ranges from unloading delivery trucks, storing groceries, stocking shelves, and greeting recipients to monitoring and unloading purple collection boxes and picking up donations from Stop & Shop, the Black Dog, Farm Hub, and other sites. Island Food Pantry, Church Street, Vineyard Haven, is open Monday and Wednesday, 2 to 4 pm, and Saturday, 10 am to noon. Visit islandfoodpantry.org for more information.